Use snow mode for accelerating and driving on slippery road surfaces, such as on snow. Press the �snow� button to select snow mode. 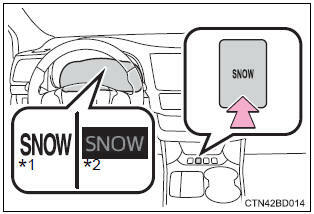 The �snow� indicator will come on*1 or will be displayed on the multi-information display*2. Press the button again to cancel snow mode.